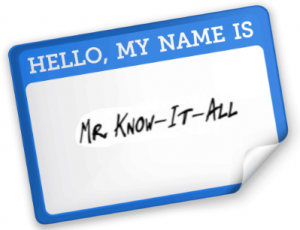 One of the many dangers in leadership is the compelling drive to know it all, or at least attempt to. Relax, you don’t need to know it all to be a highly effective leader, knowledge can be useful but focus on knowing things that will make you a better leader. Here are 6 knowledge points I have found helpful. Know how to give and to accept trust – Trust is the roadway upon which we deliver and receive within relationships. learn how to build those roads, how to use them, and how to maintain them. Know how to give and to accept thanks – Giving thanks is often overlooked, even if it was part of their job and expected of them let those around you know you are thankful for their work, and if people thank you, listen closely to what they say and graciously accept it. Know how to give and to accept advice – Profitable advice is often given in the wrong way at the wrong time. Learn to know how to spot the opportunities to speak into people lives and surround yourself with people that will speak profitable advice into your own life. Know how to give and accept responsibility – You don’t need to be responsible for everything. Learn to give responsibility to others and to be transparent in your own responsibilities. Know how to recognize your limitations – You can’t do everything and you were never meant to do everything. Whoever first said “I can do anything” has led a lot of people down a painful road. Know that there are some things you just can’t do. Know your purpose – Your purpose should be in close alignment with your talents. Having a purpose that is not achievable with your talents is painful for you and for those you are leading. Know what your talents are and embrace them. The next time you feel absolutely compelled with the need to know, step back, think it through, and consider that maybe you don’t need to know. Do you have a knowledge point you have found helpful? Feel free to share it in the comments!